We try and fail to lose weight, be better partners, better parents, get fit, get organized or fix our finances. For most of us, the main barrier to personal progress is ourselves. We know what to do, but we can’t make ourselves do it. Gumption is the power to do what needs to be done, when it needs to be done. 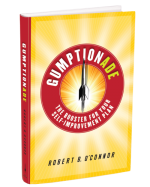 Gumption is courage + resourcefulness + common sense. These are attributes you can strengthen. You can be more, do more and have more power to live the life you want. Gumptionade will show you how. Author of The Deal: A Guide to Radical and Complete Forgiveness.